This collection deals with records addressing the issues of cloning, stem cells, family planning, and other related matters. 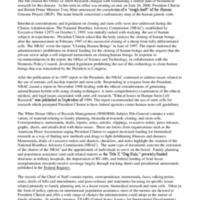 These papers document the efforts of the Clinton Administration to expand family planning on both the domestic and international level, to put restrictions and limitations on cloning, and to arrive at some sort of agreement that would make it possible for stem cells to be used in research. The collection contains press releases, emails with attachments focusing on scheduling and legislation, drafts, executive orders, reports, correspondence, memoranda, and newspaper clippings.